IT’S or ITS? These straightforward tips will help you remember the difference between these two commonly confused words. Knowing whether to write it’s or its can trip you up. 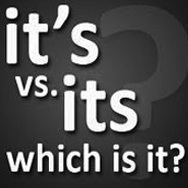 In a nutshell, it’s is always a contraction of it is or it has, while its describes something that belongs to ‘it’. The apostrophe reminds you that it’s is a contraction of it is or it has. If you can replace the word with ‘it is’ or ‘it has’ use it’s. It’s easy when you remember this rule (it is). It’s been a busy day (it has). 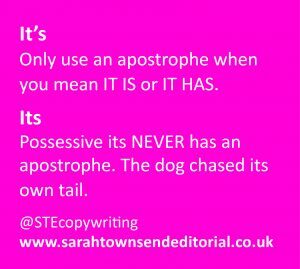 We get confused because we know apostrophes are used to indicate possession – that something belongs to someone, or something. But this rule doesn’t apply to pronouns – its, yours, his, hers, ours, theirs.